This orange color dip offers a rich combination of sweet, spicy and fiery flavours. My cookbook actually had a warning line on this page: Be Warned - once you start dipping, it's hard to stop! Preheat oven for 5 mins. Put pumpkin in a baking dish, drizzle over 2 tbsp of olive oil, salt and pepper. Roast for 20 minutes, 10 mins each side, or until tender. Put the pumpkin, garlic, giner, chilli, and remaining oil into a blender. Process until smooth. Squeeze in lemon juice and check the season to taste. The thinner chunks of pumpkin you cut, the less roasting time. I used microwave oven instead of real oven. With the microwave + grill function, it only took 15 mins to soften the pumpkins, while 20 mins with the grill only function. 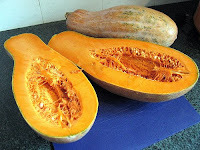 Why I use Chinese pumpkin? 2 reasons: It's easy and cheap to get in fresh market here, and it taste better for dips & soups compared to Japanese pumpkins. Can serve hot, warm or cold. It will thicken on cooling. Give a good stir before serving.